2014 -hindsight is a wonderful thing! When one year passes I like to think about the headlines from the previous year, for me, 2014 was an unusually calm, creative time. I’m only recently realising that it has taken me a long time to wind down…from a full-time teaching job in a London school; a big wedding; house-move; my first baby and then a toddler… and a second baby for good measure – it is not surprising really. I learnt to crochet in 2014 thanks to a dear, very creative, friend and this has really helped me to relax. It is very meditative and I got much more from it than I expected. I am now quite a frequent visitor of sites and blogs about crochet and have made a bag to hold all the wool I keep buying-made out of wool -naturally! We also bought a caravan, so that we could stay overnight near our (heart-lift) beach hut and because we are useless at booking holidays, this is a very good way forward for us, plus I got all the pleasure of decorating it with fun seaside interiors- that for the first time-I felt I could use authentically! Last year, I had a 1 year old turning 2 and 4 year old turning 5 -so two cakes were also in order – pictures above! I say made. 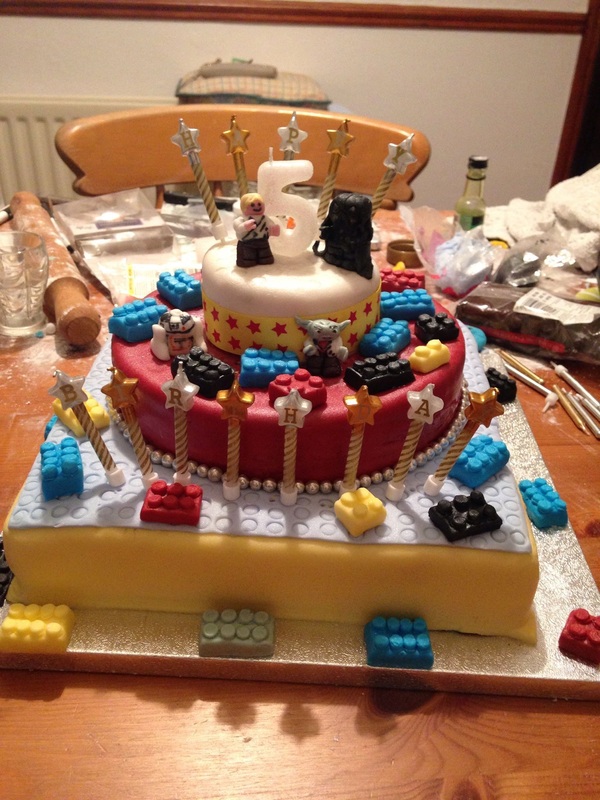 I had to cheat a bit, as my children are born a week apart, to make the cakes and ice them to the ‘very’ specific requests of a Lego Star Wars and rabbit theme was a bit of an undertaking. As it was, I had to retreat for a whole weekend to complete all the little figures and Lego pieces! So, I took the advice of a friend who had noticed I always baked them myself and bought Madeira sponge in various sizes and shapes this time- and I was free and happy to fiddle with fondant to my hearts’ content! Fondant is a joy to play around with: the texture and colours- play-do -for grown-ups! The best bit, is the reaction I get from my little boy when he sees his birthday cake and, eyes-wide, asks, ‘can I really eat all of that? -the bits on top too?’ He asks the same question every year and I always smile and say yes and then it all feels so very worth it. 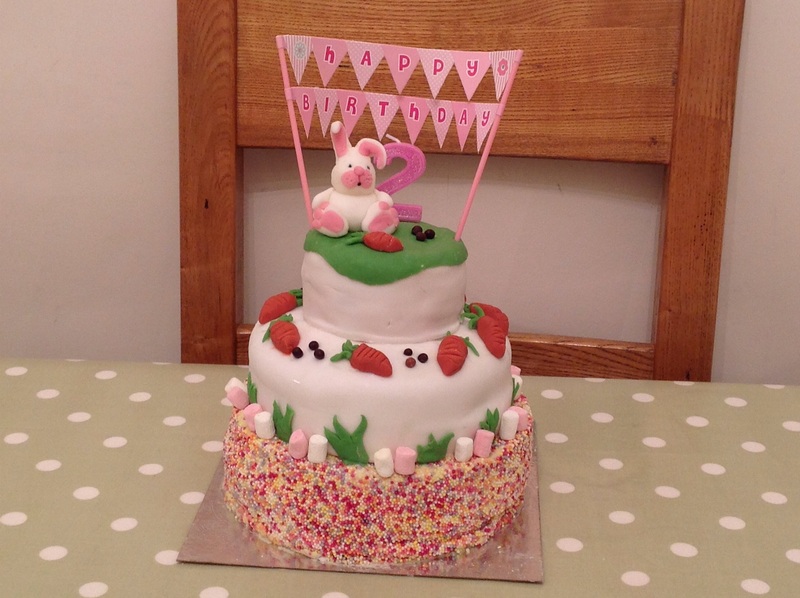 It can be frustrating working with fondant icing – when you have a clear idea of the end product but it won’t come together. This is usually because I lack the right tools (yes, I know a bad carpenter and all that!) but it is true with fondant! It is temperamental. If it’s too warm it gets sloppy and sticky, too cool and it won’t flex and splits. It needs gentle, barely-there touches and clever techniques. Saying that, I’ve gotten by as an amateur up to now -but probably made everything so very much harder for myself! I was bought a lovely set of tools for Christmas and so 2015’s cakes will be a breeze i’m sure! “A life-sized Elsa and a Turtle that speaks mandarin you say?” No problem, I have a fondant starter pack.